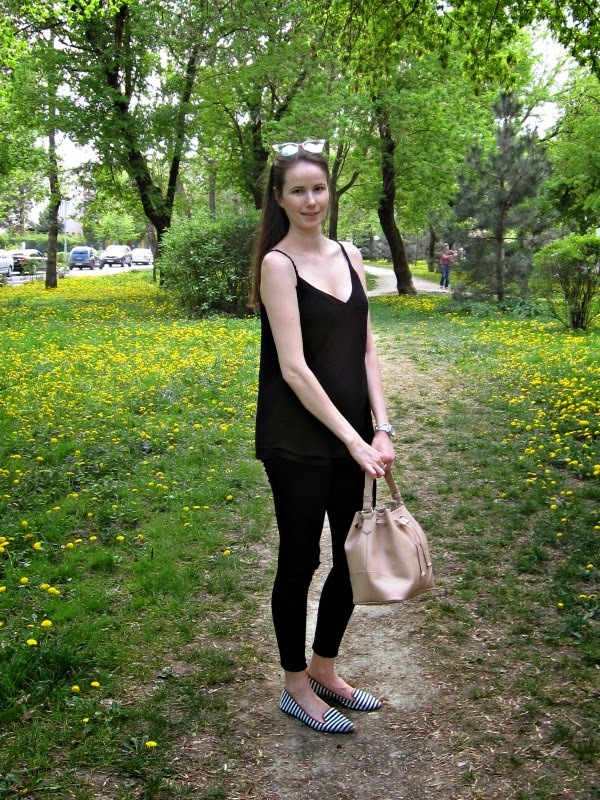 Today I am sharing a look I wore a couple weeks ago to go for a casual lunch in town. I cycled there, hence the leggings, which happen to be most comfortable. It was sunny but not quite warm enough for shorts. I paired this with a black loose fitted top which I love and wear on a regular basis. To brighten it up a little I wore my blush bucket bag and striped loafer flats. As you can see Spring was in full swing by then, with all the flowes popping up. I spent the past two days with my mum, who visited me for a couple days after my exam. We went shopping (picked up this new bikini), had brunch (pancakes!) and spent the afternoon at the spa. Such a fun girly day, just what I needed to help me get through the rest of this exam period! Hope you all are having a great start to the weekend :). Chat soon! I love you white, beautiful skin, you are divine!